Through the new On Core Electives Program at IHM School students have the opportunity to select Mechanical Drawing for one of their electives. 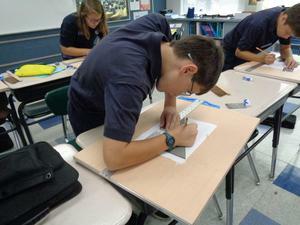 Students participating in this class, taught by Mr. Ed English, learn intensity, precision and visualizing the world. We are excited to offer IHM Students classes that enhance their academic experience and give them opportunities to find interests for future career opportunities.